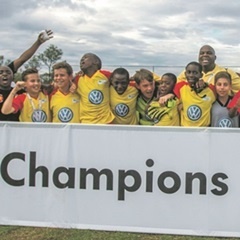 IN IT TO WIN IT: The Hatfield VW Under-15 team took home the 2015 Volkswagen Junior Masters championship. Johannesburg - The University of the Witwatersrand will host the Under-15 Volkswagen Junior Masters Tournament on December 7. The tournament will feature 16 teams from across the country. Most of teams participating in the tournament will be from Gauteng. Matt Gennrich, the general manager of communications at Volkswagen SA, says: “The VW Junior Masters programme is about supporting dealerships and communities the dealerships serve. “However, the majority of our dealerships are in Gauteng as it is the economic hub of South Africa, so it makes business sense to host the competition in Gauteng". Gennrich says the Junior Masters is a national competition and players and dealerships from outside Gauteng are encouraged to participate. Successful teams and players, who are not from Gauteng are flown in to participate in the competition. The winning team will represent South Africa at the international Junior Masters tournament in Berlin, Germany, next year. This year, Bafana Bafana and SuperSport United midfielder Dean Furman is the ambassador for the tournaments. The teams will arrive on December 7 and the tournament will officially start the following day. There will be four groups, each featuring four teams, and group winners and runners-up will battle it out until the finals on December 9. The VW Masters was established 18 years ago and is now played in more than 20 countries around the world. Every second year, the international champions come together for the championship to compete against one another. The last Junior World Masters tournament was played in Paris, France, in May last year and Germany clinched the title.